It was the stuff scary stories are made of ... a frightening creature prowling around in the dark, no one brave enough to get close and investigate just what it was. It took several agonizing months before someone finally mustered up the courage to stop and check it out. The animal was bony with patches of fur completely missing across its body, but all around its head and neck was a huge fluffy mane, almost resembling a werewolf. It hunched over and limped when it walked. The DodoThe skin peeking through its patchy fur was scaly. Its tail was pointy and shriveled like a creature from a horror story. A courageous woman passing by the California orchard where the monstrous looking animal frequented couldn't believe what she was seeing. She put a plea on Facebook immediately asking someone to come help her figure out what the animal was and if it needed help. "I was about ready to cry when I saw how bad off he was. He was really on his last leg. He was depressed and could barely even stand up", told local animal lover and dog rescuer Megan Bowe. It wasn't a werewolf terrorizing the area in time for Halloween. 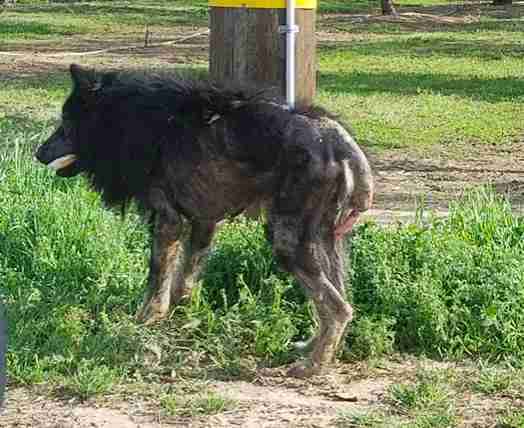 It was an incredibly sick, near-death German shepherd. Megan started calling him King and gingerly rushed him to her car and off to an emergency vet. King innately knew Megan was trying to help him, because he willingly went with her without any fuss or aggressive tendencies. 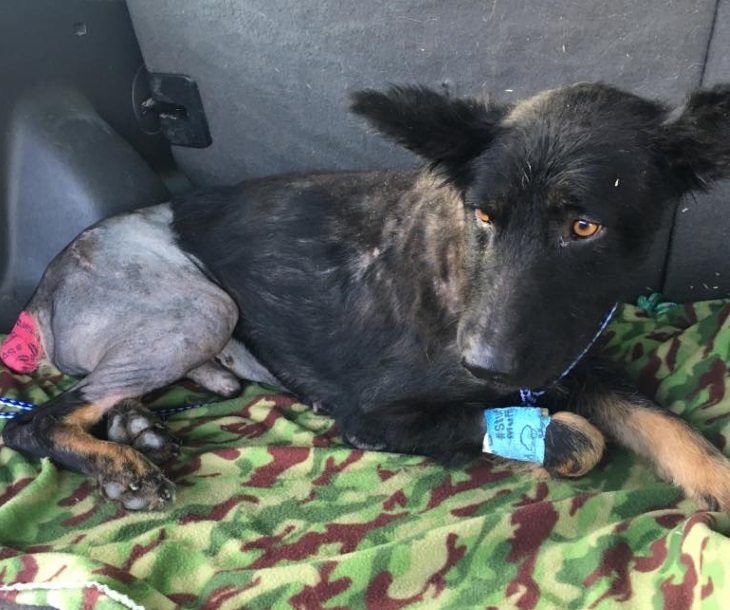 The vet discovered King had a broken pelvis, a severely broken tail and scabies. He appeared to be well into his years at first glance, but he actually was just a 12-month-old pup. 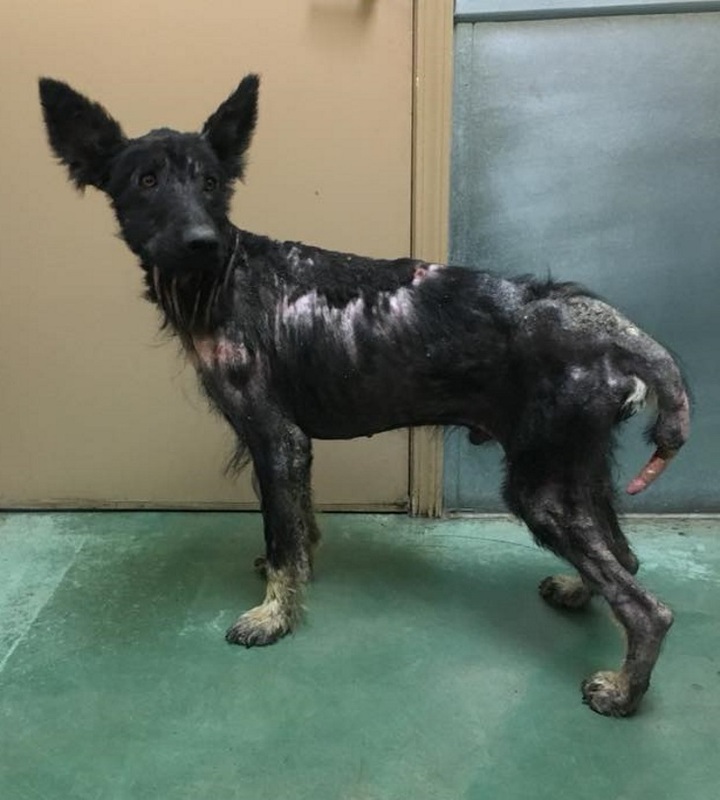 It took approximately six weeks of nonstop feedings, medicine and dedicated care around the clock before King's scabies improved and he was ready for surgery on his hip and tail. He might eventually need surgery on his other hip, too, however. It will be a few more months until King will be ready for adoption. But for now, Megan is showing him what it's like to be unconditionally loved, to enjoy life as a normal pooch snacking on dog treats, going on gentle walks and breathing in the fresh air on car rides with the windows down. "He is happier than ever now. It's hard to think that all those cars passed him by and never stopped. No one wanted to bring him home or help him because he looked so bad ... But all it took was one person", added Megan. 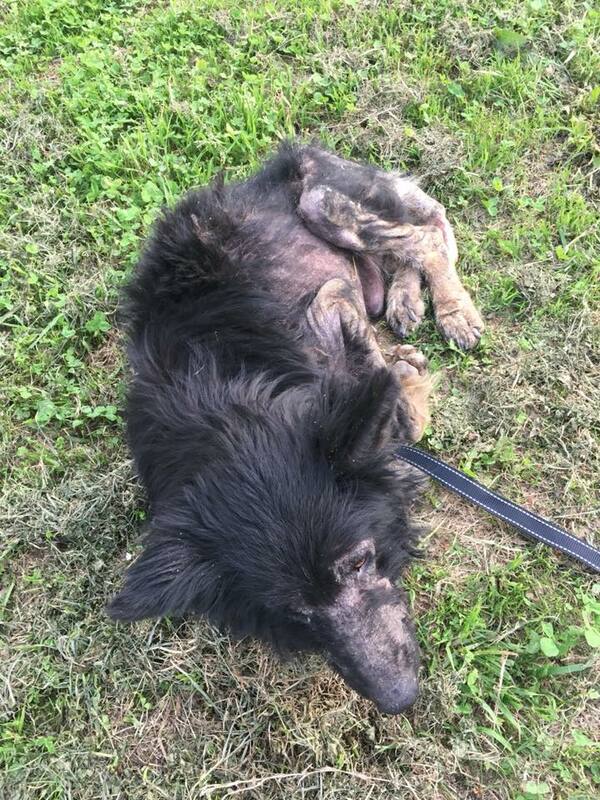 Thank goodness one stranger, one kindhearted and compassionate individual stopped and asked for help to save King. We hope he finds a wonderful furever home soon! Please SHARE this amazing story with Friends & Family!